All yard and field games have inherent risks, but there are many things parents and teachers can do to foster safe school games outdoors. Kids want to have fun and can get pretty competitive. Adults should plan games that pose the least risk while providing maximum fun. When kids hear the word "safe," they often equate it with boring. Sometimes trying out a new game provides enough excitement to make them forget it is also less risky. Perfect for kids from kindergarten through grade 5, this game uses elements of baseball combined with basic skills to create contact-free fun. 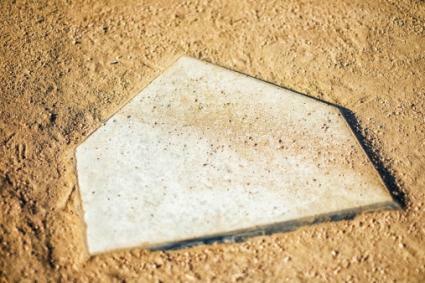 Object: To get all of your teammates across home plate, scoring the most points in the game. Split the group into two equal teams. One team is "at bat" first, and the other is in the field first. The fielding team chooses a "pitcher" for each inning who stands on the pitcher's mound. The rest of the team positions themselves in any place on the field as long as they are behind the pitcher's mound. There is no "catcher." The "batting" team selects a starting lineup. Each player takes a turn until the team has three outs. The first "batter" starts on home plate. The "pitcher" calls out either "jump," "hop," or "skip." The "batter" and all the outfielders can only move following that command. The "batter" skips, hops, or jumps to first base as fast as he can to avoid being tagged by the opposing team. For example, if the "pitcher" calls out "hop," the "batter" hops all the way to first base while the field team hops toward the runner trying to tag him. If a player is tagged, performs the wrong movement, or doesn't move properly all the way to the base, he is out. After three outs the teams switch sides. Play as many innings as you have time for, just be sure each team gets the same number of "at bats." The team with the most runs at the end of the game wins. The slow-paced nature of the game and use of simple physical movements make it a safer version of baseball. Best suited for upper elementary kids, Slow and Steady is an individual competition encouraging listening skills and self-control. While it is essentially a race, the slow and thoughtful movements leave little room for contact with others or over-exertion. Object: To be the last person to cross the finish line. 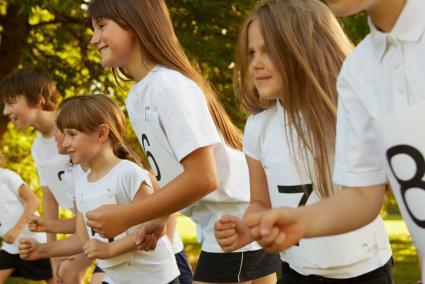 All students start behind the starting line in a standing position. The teacher, or selected student, calls out the slow characters listed one at a time as they please until there is a winner. Students must move like the character that is called toward the finish line as slowly as possible. If a student mimics the wrong character or does not move at all, she is out. The last child to cross the finish line is the winner. Children of all ages can enjoy this fast-paced game of skill. 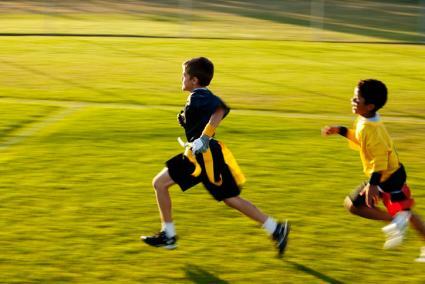 Flag Tag is a combination of a few recognizable outdoor games that eliminates physical contact and involves some strategy. Mark the playing field by designating a large rectangle. Mark a horizontal line across the center of the playing field. At each end of the playing field create a "prison" by marking a line at least two feet from the end of the playing area. Object: To avoid being tagged, or losing your flag, and to detach the flags of both taggers on the opposite team. Create two equal teams, each wearing one color flag. Designate two taggers for each team. When game play starts, the taggers try to detach the flags from players on the opposite team. Taggers are the only ones who can detach flags from regular players. Anyone can take the flag from a tagger. Regular players try to avoid losing their own flags while also trying to detach the flags of the taggers on the opposite team. If a player loses his flag, he must go directly to the "prison" area. He can only be freed if the tagger who tagged him loses a flag. Once a tagger loses his flag, he cannot return to the game. When both taggers on a team are flagless, the game is over and the other them wins. While there are risks involved with any outdoor game like accidental trips, inadvertent collisions, and environmental hazards, there are also many ways to add elements of safety. A safe environment is the first step to a safe game. When possible, choose a fenced playing area to prevent unauthorized persons from entering and keep students from straying into unsafe areas. Check the ground for potential hazards, such as exposed tree roots that could trip students, trash, dangerous plants, and animal homes. A safety checklist can help ensure you have thoroughly examined the area. To keep students safe from other types of dangers, encourage proper dress, hydration, and sunscreen for outdoor activities. One of the most important factors in safe games is to ensure students are playing the game properly. The exuberant energy and limitless imagination of school age children can result in crazy game variations that may be dangerous. Before playing a game, make sure students understand the rules and are aware of the consequences for breaking them in an unsafe manner. Establishing a clear discipline policy before playing games and controlling horseplay or reckless behavior immediately will help cut down on dangerous situations. Games need intact equipment to be played safely. Carefully inspect balls, bats, nets, and other equipment before and after play to ensure there are no problems. Regularly examine playground equipment, such as jungle gyms and swing sets, for rust, weak spots, splinters, missing screws, sharp edges, and other hazards that could cause injuries. Maintaining equipment properly will also extend its lifespan, letting more students enjoy games safely. Adequate supervision is necessary to keep outdoor activities and games safe. At least one adult will monitor students involved in organized games, but two or three is ideal. Avoid playing in the game because it limits your ability to monitor the safety of all players. Watch for blatant safety violations and take note of other behaviors, such as bullying or inattentiveness, that can lead to injury. 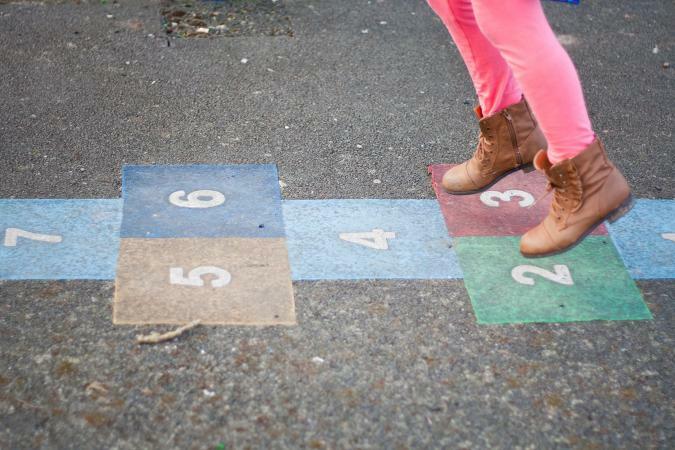 These popular playground games often have several variations so you can adapt them to different environments or age groups. When an adult carefully monitors how the game is played, she can make adjustments if necessary to keep the activity safe and fun. While you can never prevent all accidents or injuries, you can ensure kids have the best chance for safe fun by planning ahead. Provide exciting, challenging, safe outdoor activities to make children happy and contribute to a healthy lifestyle.